Francisco Filho,is one of the most techniqueful and powelful kyokushin fighter I've ever know. 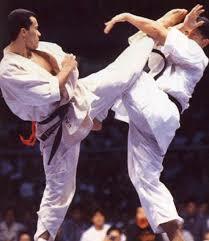 Francisco "Chiquinho" Filho (born January 10, 1971) is a retired Brazilian Kyokushin Karateka and kickboxer. He is one of the few non Japanese fighters to have successfully completed the 100 man kumite. Francisco Filho made his professional K-1 fighting debut on July 20, 1997 at the K-1 Dreams 1997 tournament against the legendary Kyokushin and Seido Kaikan fighter Andy Hug. This was their second encounter, the first being at the 5th Kyokushin World Tournament in 1991 that resulted in a victory for Filho. The second fight was also won by Filho quickly earning the Brazilian a large fan base in Japan as well as making him one of the then top contenders for the K-1 World GP Championship title. Filho has since held championship titles in both K-1 as well as in IKO-Kyokushin Kaikan. He has not taken part in any major competition since 2004 but remains active developing young fighters and in overseeing Brazil’s Kyokushin national team . Nowadays, Filho take his time to train a new talent of kyokushin karate fighter. He now, on his dojo in Rio de Janeiro, Brazil being a shihan ( a great teacher of kyokushin) who dedicate his time and effort to make a new brazilian kyokushin star. Francisco Filho in his country, brazil, also well-known as 'the killer' . Means he fights very hard, powerful, and strike with very efective move. Therefore he's often makes his oponent scare of him. identical type with Ryu Narushima from Japan they famous for his 'ichigeki' tehnique (ichigeki means one-strike-knock-down) which make them a tousgh KO-artist. Filho fighting records, fact & statistic can be seen here.